The tradition of decorating your home with holly at Christmas, comes from the early pagans of Europe who began the tradition. We would probably agree with them that holly looks pretty especially around the festive season. It smells nice, too - add to that its capacity to bend without breaking, and you have the perfect material for all kinds of decorative purposes – wreaths obviously being the most popular one. Holly is great for twisting around the railing of your staircase as well, for example, or for use in seasonal bouquets. It’s a common decorative element in churches, too. Mistletoe is slightly more peculiar: Let’s all be honest here and acknowledge that mistletoe is not exactly the best looking plant in the natural world. Making its widespread use even weirder is the fact that mistletoe is actually a parasite: it grows high up in trees, feeding on the life juices of its host. Now is that the kind of thing that you want to bring into your home? And yet that’s exactly what people all over the planet do. It gets a little easier to understand the ubiquity of mistletoe when you delve into the rich history of the plant. Its medicinal qualities, for example, have been praised throughout the centuries. Mistletoe is used to treat respiratory and circulatory diseases, and various scientists are studying how it can be used in the treatment of cancer. Not surprising, when you know that Druids relied on mistletoe to cure people of poisoning symptoms – even if its own berries possess some toxins. They also believed mistletoe was magical, and that it could protect humans from witchcraft. In ancient Romanian culture, mistletoe was thought to be a source of good fortune, but it is Norse mythology that is at the root of the most common phenomenon associated with mistletoe: kissing. 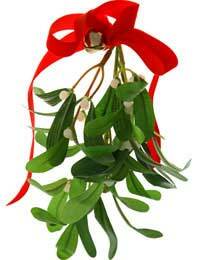 According to an old myth, Balder, the god of the summer sun, was killed with an arrow dipped in mistletoe. His mother, Frigga, cried so long that the berries of the mistletoe changed colour from red to white, thus bringing Balder back to life. She was so happy to have her son back that from then on she started kissing everyone who stood underneath it. The association between mistletoe and kissing has spread all over the world, largely because of depictions of the custom in films and literature. Scandinavian tales believe it symbolises peace and love and the tradition of kissing under the mistletoe is based upon the belief that no harm should come to anyone standing beneath the plant - and subsequently that they should only receive tokens of affection. What few people know, though, is that there is actually such a thing as “mistletoe kissing etiquette”: when a man kisses a woman under the mistletoe, he needs to pick one berry from the plant. When all the berries have been picked from the mistletoe, you are actually no longer allowed to kiss underneath it. But will you let that stop you? Want to know about some more Christmas 'plant' traditions? Here's a feature about the poinsettia and its associations with Christmas.